Speakers series offers presentations on some of today’s critical topics: business, science, environmental issues, religion and education. As part of its 150th anniversary year celebration, Lakeland College is presenting the Great Thinkers Series. The lineup offers thought-provoking presentations on some of today’s critical topics, including leadership, business, science, environmental issues, religion and education. The lectures are free and open to the public, but please call (920) 565-1536 to make a reservation. All lectures are at 11 a.m. in the Bradley Theatre unless noted. Lonnel Coats, president and CEO, Eisai Inc., will speak at this annual gathering of faculty and students that officially opens Lakeland’s academic year. Coats joined Eisai Inc. in 1996 as a regional sales director, but quickly advanced through a series of positions, culminating with his appointment as president in 2004. He led the creation of Eisai’s managed care group, helped build the company’s U.S. presence in neurology and primary care and has worked with the clinical development team on numerous products in development. In his current roles as president and CEO of Eisai Inc. and president of Eisai Corporation of North America, he is responsible for the strategic direction of the U.S. business. In 2007, the Healthcare Businesswomen's Association honored Coats as its Mentor of the Year, an annual award bestowed upon one man in the industry who has demonstrated long-term support for the advancement of women in the healthcare industry. Russell Feingold, former U.S. Senator from Wisconsin for 18 years, will deliver Lakeland’s Constitution Day lecture. Feingold served on the judiciary, foreign relations, budget and intelligence committees. He served in the Wisconsin State Senate from 1983-93 and practiced law for six years at Foley & Lardner and LaFollette & Sinykin in Madison. He drew national attention for leading the fight for campaign finance reform in the Senate, and he has always championed efforts to limit the influence of special interests. Professor in the Physical Sciences at the University of California, Berkeley, is one of the world's most highly-cited astronomers. He is the recipient of numerous prizes for his scientific research, and was a member of the teams that discovered the accelerating expansion of the Universe, which will be the subject of his Lakeland presentation. This discovery was voted the “Top Science Breakthrough of 1998” by Science magazine and received the 2007 Gruber Cosmology Prize and the 2011 Nobel Prize in Physics. Filippenko was named the Carnegie/CASE National Professor of the Year in 2006. He has produced several astronomy video courses for The Teaching Company, and appears in numerous television documentaries, including dozens of episodes in “The Universe” series on The History Channel. Emilie Townes, Andrew W. Mellon Professor of African American Religion and Theology at Yale Divinity School, will explore the history and development of racial stereotypes in the U.S. An ordained American Baptist clergywoman and teacher, Townes counts among her many publications “Breaking the Fine Rain of Death: African American Health,” “Womanist Ethic of Care; Womanist Justice, Womanist Hope;” and “In a Blaze of Glory: Womanist Spirituality as Social Witness.” Her research interests focused on Christian ethics, womanist ethics, critical social theory, cultural theory and studies, postmodernism and social postmodernism. She has served as president of the American Academy of Religion in 2008. Lillian Daniel, senior minister, First Congregational Church, Glen Ellyn, Ill., will address the question of “spiritual” vs. “religious” in contemporary culture and how we find God in all kinds of unexpected places, even the church. Daniel hosts the Chicago-based public television program “30 Good Minutes.” An editor-at-large for the Christian Century Magazine, and a contributing editor at Leadership, her work has also appeared in The Huffington Post, Christianity Today, Leadership Journal, Books and Culture, The Journal for Preachers and in the daily email devotionals available at ucc.org. She is the author of “Tell It Like It Is: Reclaiming the Practice of Testimony,” which is the story of one church’s attempt to get mainline Protestants to talk to each other about God. Paul Adams III, founder and president of Chicago’s Providence St. Mel School, will discuss the dynamics that have shaped his life and philosophy of education, as well as his views on how American education is failing our children. He led the transition of nationally-acclaimed Providence St. Mel School from a private Catholic high school in Chicago to a not-for-profit independent school. Under his leadership, Providence St. Mel has developed into a premier college preparatory learning institution for African American students. Currently, 100 percent of Providence St. Mel’s graduating seniors are accepted to four-year colleges, with more than 50 percent attending top-tier and Ivy League institutions. 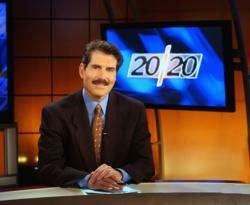 Thursday, April 25, 2013 – 7 p.m.
John Stossel, a veteran television reporter and commentator, will deliver the 12th annual Charlotte and Walter Kohler Distinguished Business Lecture. Stossel joined Fox Business Network in 2009 and his weekly program “Stossel” highlights current consumer issues with a libertarian viewpoint. Stossel also appears regularly on Fox News Channel. Prior to joining FBN, Stossel co-anchored ABC’s primetime newsmagazine show, “20/20.” There, he contributed in-depth special reports and recurring segments on a variety of consumer topics, from pop culture to government and business. Stossel’s economic programs have been adapted into teaching kits by a non-profit organization, “Stossel in the Classroom.” Stossel has received 19 Emmy Awards and has been honored five times for excellence in consumer reporting by the National Press Club.